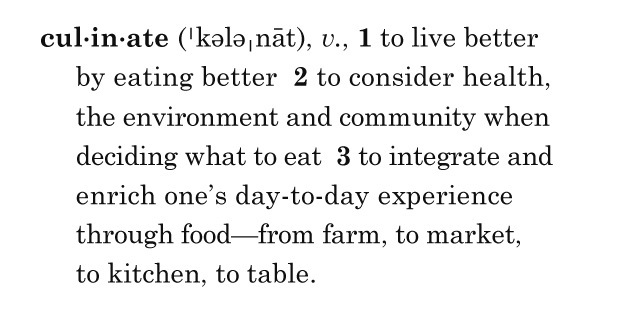 We're food people who write and word people who eat, so it only seems natural we would invent a new word to define what we're all about: "Culinate." Then, because that was so much fun, we decided to gather all the words that help define what we do, most of which have been around for several centuries, and put them here. Enjoy! 1858 MULOCK A Woman’s Thoughts About Women\: I am truly thankful, and sincerely indebted to her too; for a good cook is a household blessing. 1667 MILTON Paradise Lost\: Whoso eats thereof forthwith attains Wisdom. 1956 SEARS/THOMAS Man's Role in Changing the Face of the Earth\: The situation is clouded by a widespread confidence that this impact of man upon environment can continue indefinitely. 1807 CRABBE The Village\: Fields and flocks have charms / For him that gazes, or for him that farms. 1595 SHAKESPEARE King John\: My faire sonne, My life, my ioy, my food, my all the world. 1697 DRYDEN Virgil’s Georgics\: And seek fresh Forrage to sustain their Lives. 1616 SURFLET & MARKHAM Country Farme\: The first foundation of a good House must be the Kitchin. 1918 LEACOCK Frenzied Fiction\: What amazes me, in returning to the city, is to find the enormous quantities of produce of all sorts offered for sale in the markets. 1719 DEFOE Robinson Crusoe\: To make such necessary things as I found I most wanted, as particularly a Chair and a Table.